Long before the Kamikaze attack during the Battle of Leyte Gulf, off Luzon in the Philippine Islands during World War II, the USS Claxton with George Bothum aboard saw considerable action in the Solomon Islands off Guadalcanal, Bougainville and Tillage earlier in the war. 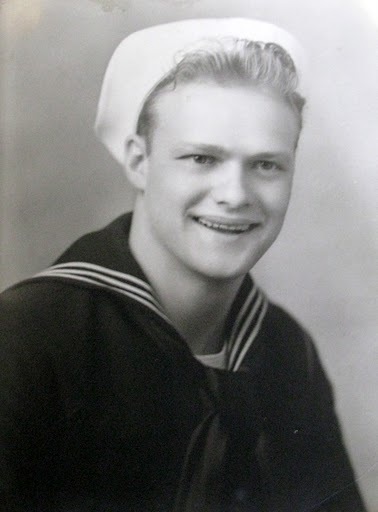 The 87-year-old Venice resident was a throttle-man in the main engine room aboard the Fletcher Class destroyer when he was not at his battle station as a trainer on one of the ship’s main five-inch guns. The Claxton was part of Destroyer Squadron 23 that served under Adm. Arliegh Burke. The Claxton took part in the Battle of Empress Augusta Bay off Bougainville. A Japanese cruiser force was intercepted in the bay by the cruiser USS Montpelier and other ships on Nov. 2, 1943. They surprised the enemy battle group. By daybreak the surviving enemy ships had retired. They Japanese lost two heavy cruisers and two destroyers in the engagement. While American forces sustained minor damage to the cruiser Denver. The destroyer Thatcher suffered substantial damage to its fantail and had to be towed back to port. Destroyer Squadron 23 would receive a Presidential Unit Citation for its actions in the Solomon Islands. The 7th Fleet headed for the Philippines and the invasion of Leyte Gulf on Oct. 12, 1944. The Claxton was slated to bombard the beaches in preparation for the invasion of American forces. Their squadron was also to screen the battleships that were headed for the Gulf, too. At the same time a Japanese task force was headed for Leyte Gulf. American forces outnumbered the enemy about four to one in ships and fire power. PT boats attacked the Japanese in the early morning as they entered the Gulf with good success. The Japanese lost two battleships, three cruisers and four destroyers. The ships that got away were damaged in the attack. “On Nov. 1, 1944 at about 1 p.m. the Claxton was attacked in Leyte Gulf by a Japanese Kamikaze plane,” an official government report notes. Bothum picks up the story from there. Four two days and two nights the Claxton’s heavy guns bombarded Japanese positions on the beach and further inland in support of the American invasion by Marines and Soldiers. “Swarms of Kamikazes started showing up as our heavy ships moved out of the gulf and further to sea so they had maneuvering room. They had the fire power we lacked. All we had were the five-inchers, 40s and 20 millimeter antiaircraft guns,” Bothum explained. “I pointed to a Kamikaze headed right for us carrying two 500-pound bombs–one under each wing. What they tried to do is drop one of their 500-pound bombs on one ship and then hit another with their second bomb and the plane,” he said. “As we were firing at the plane, I saw one of its wings come off. “But we didn’t! The Kamikaze flew into the sea right beside our ship and exploded its 500-pound bomb. It was only 15 or 20 feet from my gun when it blew up,” Bothum added. It took the hospital ship 30 days to reach Oakland, Calif. where Bothum spent several more months at the Oakland Naval Hospital recovering from his injuries. He was discharged for medical reasons with a 40 percent disability, but received a standard Honorable Discharge. 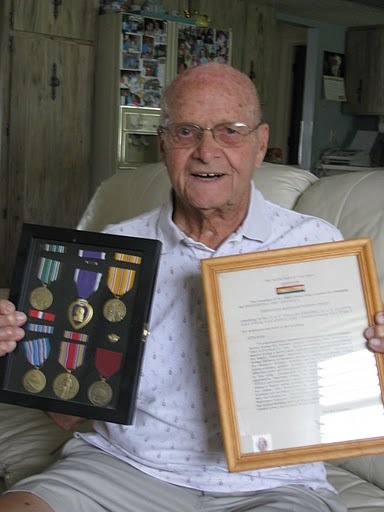 “I’m very happy to have shed my blood for my country,” the old sailor said as he wrapped up his tale of war and courage in the Pacific during the closing months of World War II. After the war Bothum went to work for Met Life. He and his first wife, Pearl, moved to Venice 20 years ago when he retired. They have two children. After her death he remarried to Donna, his second wife, who has six children from a previous marriage. “We have lots of grandchildren and great-grandchildren,” he said with a smile. This story was first printed in the Charlotte Sun newspaper, Port Charlotte, Florida on Thursday, August 26, 2010 and is republished with permission. Click here to view Bothum’s Collection in the Library of Congress’ Veterans History Project. George Vincent Bothum, 92, of Venice, FL, died on Jul. 16, 2015. Funeral arrangements by: National Cremation and Burial Society, Sarasota. George is survived by his loving wife, Donna; son, Brad Bothum, both of Venice, FL; a daughter, Beverly, of MN; and a loving blended family. Good job made bro. I have served at this great ship later in the German navy from 1976 to 1980. It was an honor to serve at he formal USS Claxton. Fletcher sailors have the most fun.